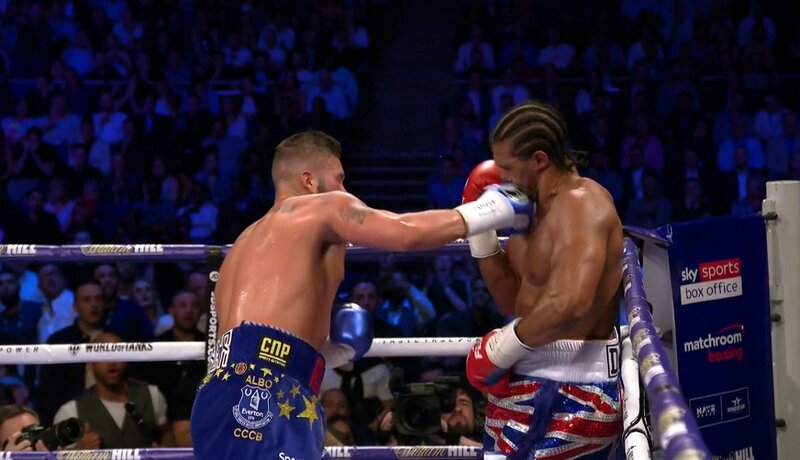 In tonight’s rematch between British foes, Tony Bellew (30-2-1, 20 KOs) defeated an injured David Haye (28-4, 26 KOs) by a 5th round knockout to close the book in their rivalry on Sky Box Office at the O2 Arena in London, England. Bellew knocked Haye down three times in the fight. The fight was stopped with Haye on his feet with referee Howard Foster pulling the plug on the match. By that point in the fight, Haye was limping around with another injury to his right leg, the same leg that he had suffered a torn Achilles in his last fight with Bellew a year ago in March 2017. This fight was more about how bad Haye was than it was how good Bellew is. Bellew was good tonight, but he won because Haye was just so awful. He looked worse than shot. Haye looked like someone who physically was not fit to fight. Haye was knocked down twice in round 3 by Bellew. Haye’s surgically repaired right calf was injured in that round. In round 4, Haye was limping around, taking shots from Bellew and looking hurt. Bellew took it easy on Haye in the round without going after him. ”It’s been a great journey. Who’s next? I don’t know. I’m a walking Super Series. Every fight I’m in is a Super Series. I need that mega-star,” Bellew said. Bellew had the chance to fight a very good fighter at cruiserweight in Mairis Briedis in 2016, but he chose to steer around him twice by fighting fringe contender BJ Flores, and then Haye. Briedis would have given Bellew a lot of problems. Bellew could have fought the other good cruiserweights like Oleksandr Usyk, Murat Gassiev and Yunier Dorticos if he’s stayed in that weight class. It’s Bellew that chose to move up to heavyweight and fight the aging Haye. If Bellew had wanted a good opponent, he should have stayed at cruiserweight and fought one of those guys. It would likely be far tougher for Bellew to try and beat Gassiev, Usyk, Dorticos and Briedis, because they’re not old, injured and past their prime like Haye. It’s likely that Bellew will stay at heavyweight. He wants to fight Andre Ward. That’s one of the names he mentioned, but Ward is retired now and he might not want to resume his career. Bellew’s promoter Eddie Hearn could match him up against Anthony Joshua if he’s willing to wait until 2019, because AJ is booked up with fights for the remainder of 2018. Bellew will need to fight someone good at heavyweight if Hearn is going to try and sell the fight on Sky Box Office. Hearn can’t match Bellew against someone like David Allen and expect the British fans to want to pay to see that fight on PPV. Hearn would obviously like to match Bellew against Tyson Fury, but that’s not a fight that can happen soon either. Fury hasn’t fought in over 2 years, and he’s not going to fight Bellew. Dereck Chisora would be a good option for Bellew, but he’s not popular and he’s seen as a past his prime fighter. Chisora would have a good chance of beating Bellew. Joe Joyce would be a good option for Bellew, but he’s too big, and he throws too many punches. It would probably end badly for Bellew. Hearn understands how hard it’ll be to find the right guy for Bellew. It has to be someone the boxing fans in the UK will be willing to pay to see, and they have to be willing to fight him next. That rules out Tyson Fury, because he’s not going to fight Bellew next.